In 1880 the first Military Tournament was staged in an Agricultural Hall from which the present Royal Tournament evolved in 1883, but the Royal Navy did not take part until 1896. During Ladysmith (1899) Captain Percy Scott landed a number of 4.7 inch guns to have carriages made for them. Two of these together with four 12 cwt 12 pounders were dispatched to the Bluejackets. It was during this campaign that one of the gun wheels collapsed. The Bluejackets manhandled the gun over two miles to the top of a hill and into action. It is these feats which today's Field Gun display re-enacts although it was not until 1919 that the 2 walls and the 28 foot chasm were introduced into the drill. Now only three Commands are represented these are Portsmouth, Devonport and the Fleet Air Arm. The Royal Tournament has now ended which also marked the end of the Royal Naval Field Gun Runs. The above picture shows the Portsmouth Field Gun Team on one of their public runs on Whale Island, which is where the Portsmouth team trained. 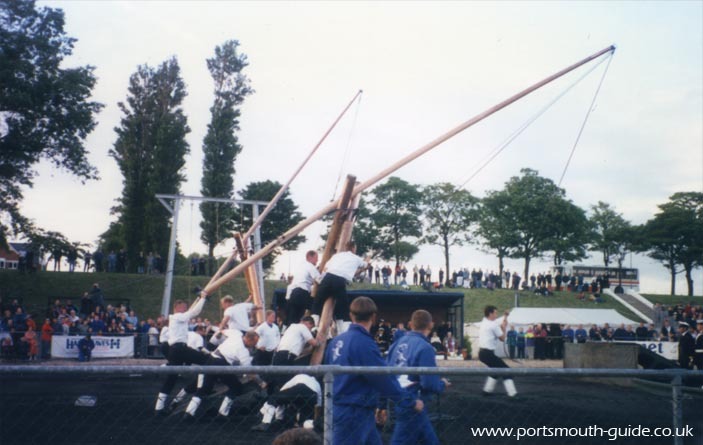 The popular event of Field Gun has come to an end with the last display of field gun by the Royal Navy being held in the Royal Tournament in 1999. "The Final Chapter" of Field Gun marks the 100 years since the Battle of Ladysmith. On Monday 2nd August 1999 the last ever Gun Run took place between Portsmouth and the Fleet Air Arm. The Field Gun crews all wore black arm bands which was contrary to their orders. They had been told that a two-second penalty for each of the 18 men in the team wearing an arm band would be given. Both teams wore arm bands so that neither would loose due to penalty points but neither team was penalised. At the end both teams gathered in the centre of the arena for a standing ovation and both teams unveiled banners, Portsmouth unfolded a banner offering their thanks for the years of support. The yellow banner, unveiled in front of the royal box where Princess Anne watched as guest of honour, simply read "The final chapter goodbye Portsmouth Field Gun". All the spectators, past and present members of the Field Gun crews were sad that the decision to end the Field Gun has been made. It has been a hugely successful event held yearly at Earls Court, drawing millions of spectators and being broadcast on television. Although the Royal Naval field gun run displays have ceased, colleges and other organizations are still carrying out variations of the display. One such college is Wellington College. Fort Nelson have also been given the old Portsmouth Field Gun and are hoping to hold displays. The link below is to Portsmouth Action Field Gun who currently hold displays. 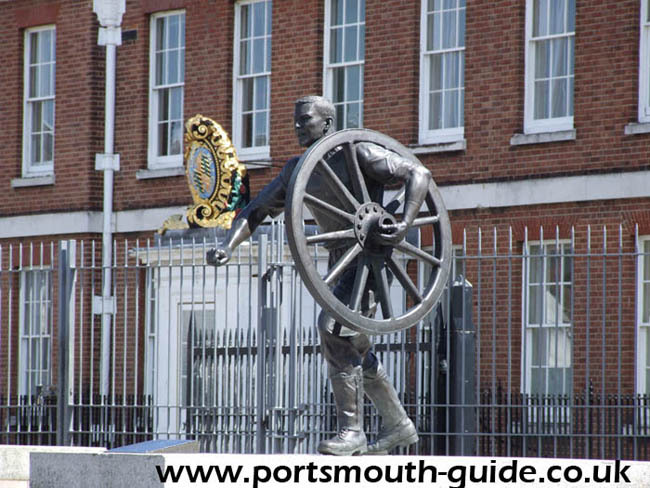 The above photograph is of a statue erected in Portsmouth's Historic Dockyard to commemorate the Field Gun competition and the teams that took part.